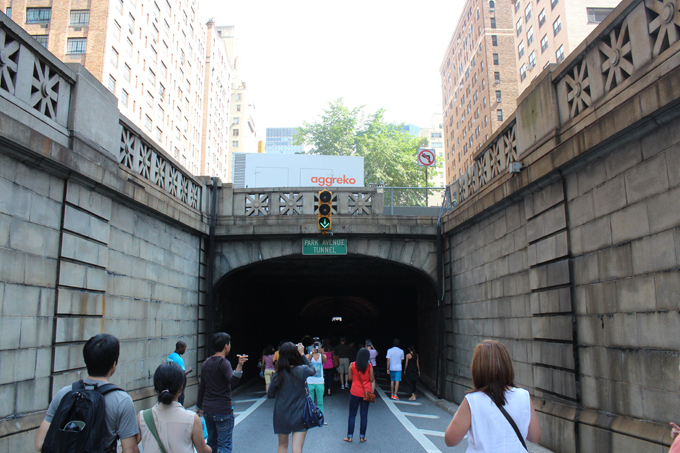 As you might have already read and seen in my week thirty three recap P and I with a lot of other New Yorkers and out-of-towners alike took over Park Avenue and Lafayette Street, which were closed to car traffic on three consecutive Saturdays in August from 7am to 1pm. A total of seven miles is being utilized for bikes and pedestrians during Summer Streets, from Brooklyn Bridge up to 72nd Street. Throughout the route there were rest stops, activities, arts and performances. 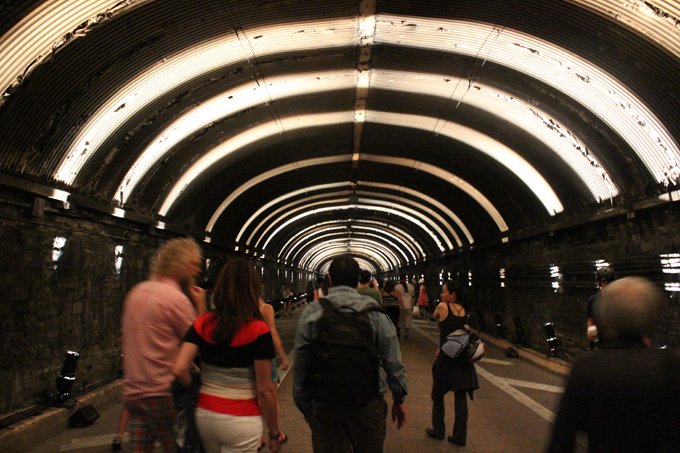 We decided that we wanted to see the Voice Tunnel by Rafael Lozano-Hemmer in the Park Avenue Tunnel, it was the first time it was open to pedestrians for this event. Because the Summer Streets website informed us that the lines for this event close at 11:30am we got there shortly after 10am and the line was huge but moved in a steady pace and about an hour later we entered the tunnel. 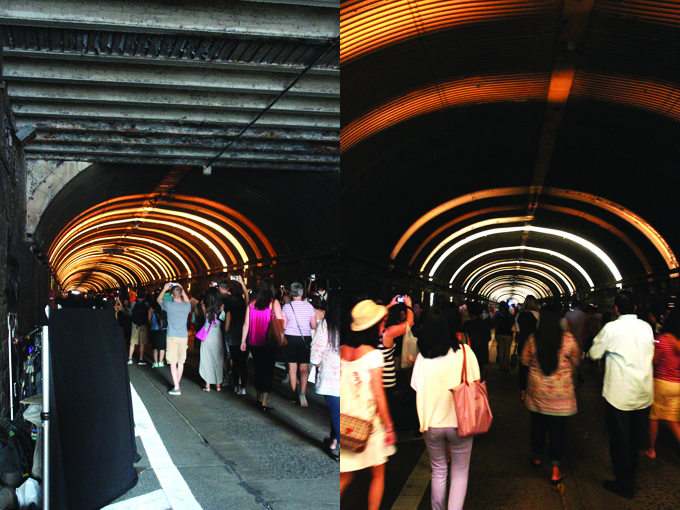 Inside the tunnel was another line for people who wanted their voices echoing through the tunnel. 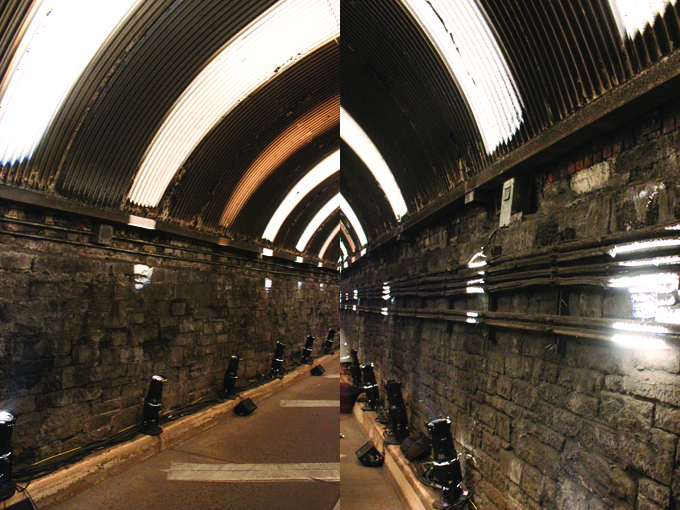 The voices influenced the intensity of the 300 theatrical spotlights positioned in the tunnel, sometimes it was pretty dim and then as the voices grew louder the light got brighter. 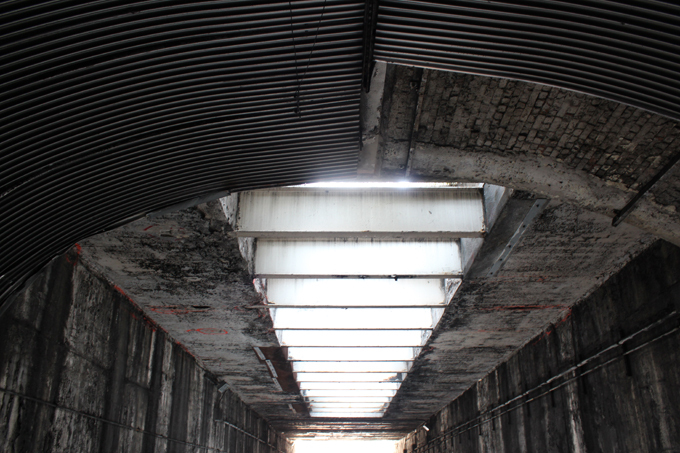 We skipped the line for the intercom, after waiting to get in we didn't feel like getting in line again and I also didn't want to hear my own voice echoing from the walls of the tunnel. It was a great experience nonetheless and of course I took way too many photos, none of the intercom you could speak into though, but Tina over at Life in Sketch did. What are your plans for the weekend? I am looking forward to a three day weekend as I took Monday off. Tomorrow we will be going rafting with a group of friends and on Sunday I might work on one of my projects. Monday is my birthday, I do not have any plans yet and will just do what I feel like that day...Happy weekend! Happy (almost) Birthday Miss Nina! How exciting for you to have such a lovely weekend to look forward to. I think you'll have a wonderful time rafting. We went white water rafting a few years ago and LOVED it. It's exciting! 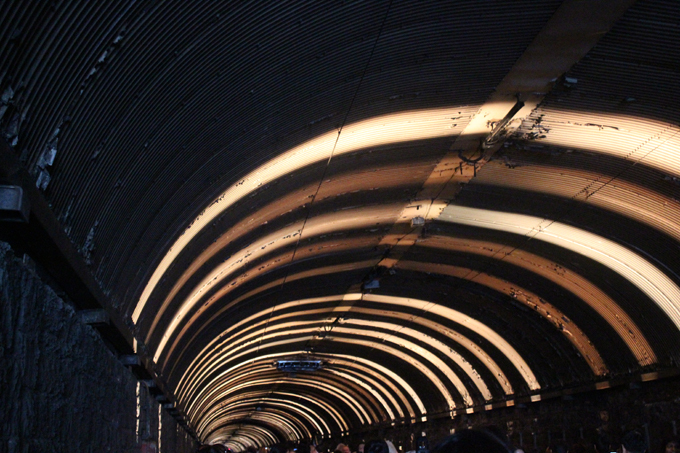 This voice tunnel looks amazing. Creepy, maybe? But amazing! Here's to a wonderful year ahead for you, dear. You deserve it! Happy early birthday! Rafting sounds like a great pre-birthday activity! Thanks for including a link to my post. You're pictures are great! Which lens did you use? I was using both my iPhone + Nikon with two lenses but because it was so dark the Nikon pics were awful. We should get together again soon! Thank you Tina! I used my Canon EFS 18-55mm lens and cranked up the ISO to 6400. And we should definitely get together soon, maybe send out an email to everyone on the list from last time? interactive art, how fun! i would definitely want to see this exhibit too and skip hearing my voice echoed over the intercom ;) but i love being in places you normally aren't able to be in it feels, yes, a little creepy but in a good way. It was definitely a good kind of creepy. Love the explore places that a normally off limits. Happy birthday to M&L! Hope they enjoyed your Domo Cake.